In my former pre-baby life, I would have planned at least three Mexican-inspired recipes to share with you well before the actual holiday, but since I have a tiny human, planing ahead is something of the past. Maybe I’ll get with it when Teddy goes off to college. Since you probably don’t share my procrastinating traits in your party planning, maybe I can tempt you with a last minute dessert/cocktail addition to your menu? I’ve had a margarita-inspired granita recipe in the depths of my recipe idea journal for years now, and each time summer or Cinco de Mayo rolls around, it gets pushed away for some reason or another. But this year, I made it my mission to follow through, even it was at the eleventh hour, and I had to wear my fussy-I-refuse-to-nap little Teddy while I tried to capture the perfectly light flakes of granita before they melted. Have you heard of granita before?? It’s a frozen Italian dessert similar to a snow cone of sorts. It typically starts with a liquid fruit base that’s poured into shallow dish, frozen, and stirred with a fork in increments until it resembles light-as-air flakes of ice. It’s light. It’s refreshing. It’s sweet, but not too sweet. It’s the perfect dessert for a warm spring or summer day. 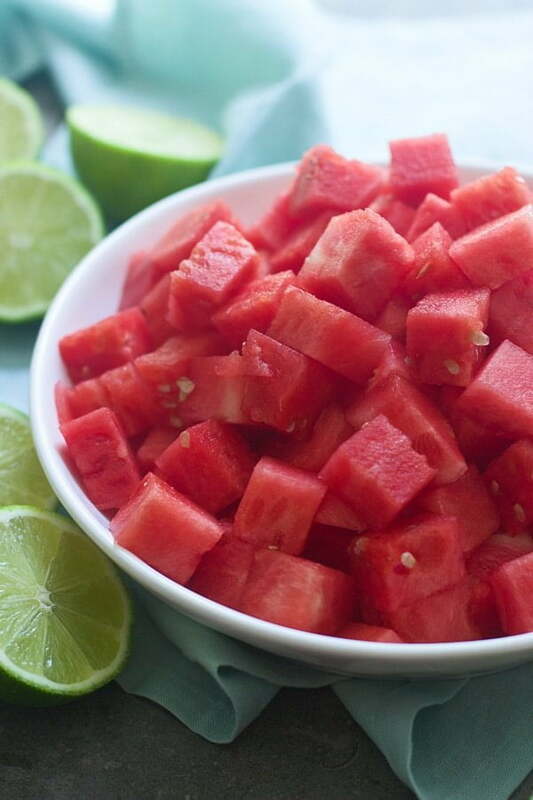 In my boozy version, watermelon, a little simple syrup, and equal parts of lime juice and clear tequila are pulverized in a food processor until the mixture is completely pureed. The liquid is transferred to a 9×12 baking dish, and popped into the freezer until it starts to crystalize and freeze. After about 20-25 minutes, I pull it out, use a fork to stir it up, pop it back into the freezer and repeat the process until all the liquid has frozen into tiny little crystals. Spoon the granita into pretty little bowls or cups, give your guests a spoon, and dig in! Add water and sugar to a small saucepan. Bring to a boil and reduce to a simmer until sugar dissolves, about 2-3 minutes. Set aside and cool completely. 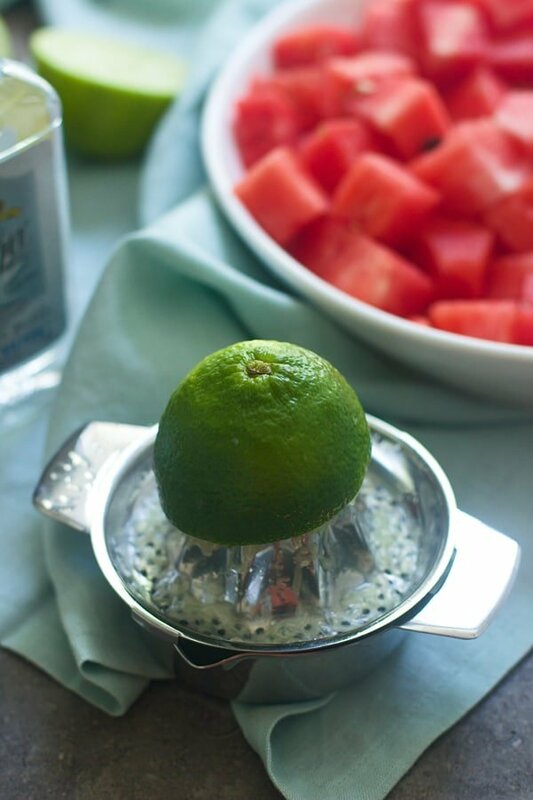 Add cooled sugar water, watermelon, tequila and lime juice to a blender. Blend until smooth. Pour mixture into a 9X12 baking dish. Place in the freezer. Freeze for 25 minutes. Pull out and use a fork to stir the mixture. Place back in the freezer and pull out again in 25 minutes, use a fork to start to flake the mixture. Repeat until the entire dish is frozen flakes. Serve immediately. 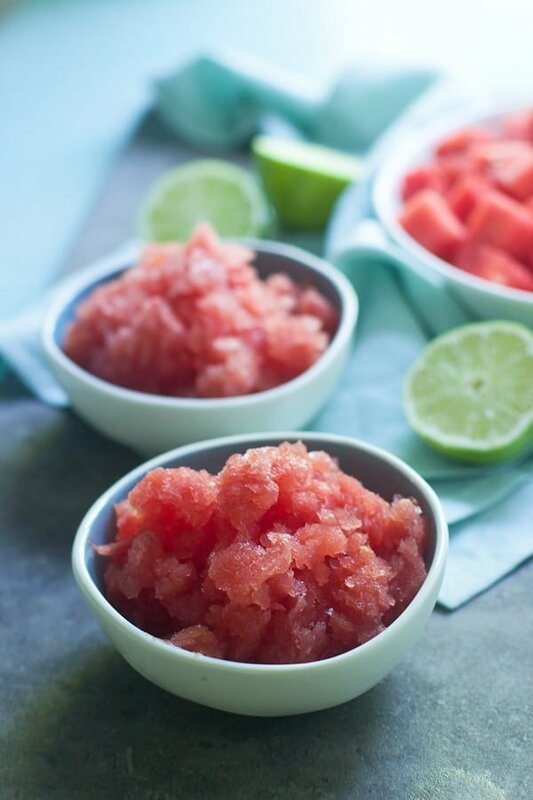 5 Responses to "Five Ingredient Watermelon Margarita Granita"
I juuust started to see watermelon pop up again at my grocery store! i really need to pick some up. This granita sounds wonderful. Happy CInco de Mayo Nicole! 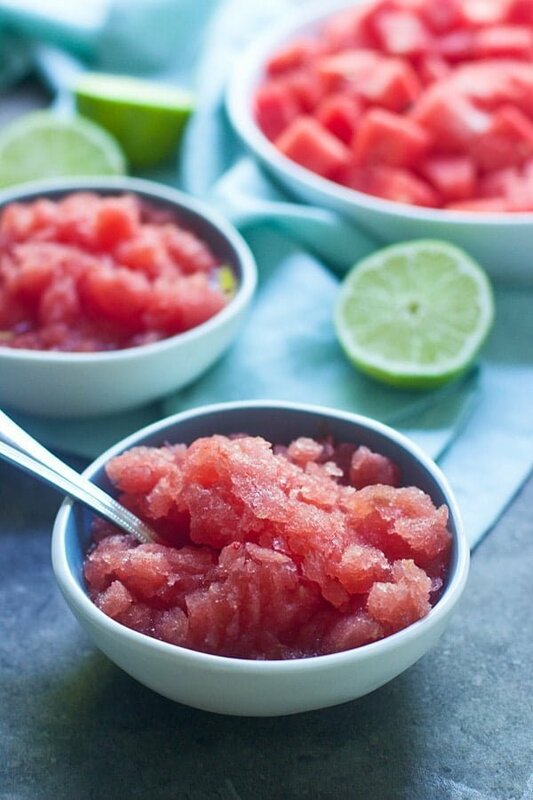 I have a ton of leftover watermen from a cookout and have been looking up watermelon granita recipes! Yours doesn’t call for straining the watermelon after the blender (which is appealing to me to save time). Curious if it improves the consistency or texture? Have you tried both ways? Thanks! I haven’t tried it both ways, but the ice has enough texture, I don’t even notice the pulp from the watermelon!